The Shabby Stamper: PCS Chipboard Bird Hop! Being inspired by the "Winged Things" theme for the April Paper Crafters Sampler, a few of the design team members put together a chipboard bird for your viewing pleasure. We hope these birds will offer additional ideas and inspiration for utilizing the new Chipboard Birds. For more ideas, please visit the Paper Crafters Sampler -- remember to use the code PCSLH. If you're coming to me from Tiffany Bauer's blog, My Crafty World, I know that you enjoyed her creation! 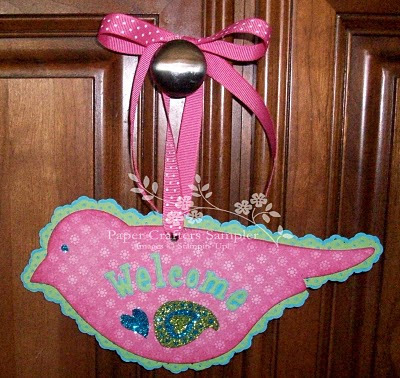 Now, hop on to Melanie Schulenberg's blog, Pockets of Inspiration, for her fabulous bird! This looks great! So girly. Very pretty! Love the glitter!! !